Ever since the Centre announced that it will carve out Telangana from Andhra Pradesh, thousands of people have been protesting the decision. However, the one at Kurnool today takes the cake. 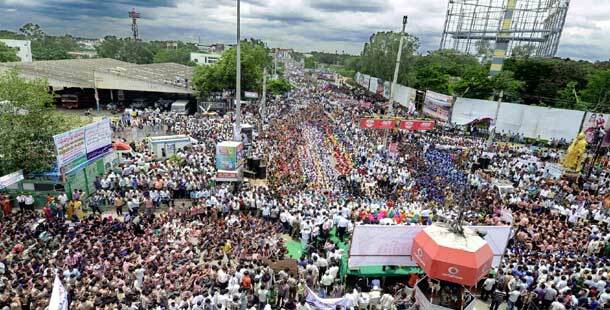 Dubbed one of the biggest protests, more than one lakh students participated in the event to oppose bifurcation of AP. The mega event “Laksha gala ghosha” (chorus of one lakh voices) on the streets of Kurnool city concluded peacefully without any untoward incident. However, normal life was thrown out of gear in the city following the massive traffic and security restrictions imposed by police in view of the 'Laksha gala ghosha'. The event was aimed at sending clear signals to the Congress High Command that they were against the division of state. Students from several colleges from across the district organised rallies to reach Raj Vihar centre. The event which began with traditional songs concluded with the speeches of several JAC and NGO leaders. With the crowd numbers touching more than 2 lakhs, the event has become a hot topic in political circles and adds strength to the Samaikyandhra movement. People from all walks of life were seen taking part in the event which is a first in the history of Kurnool. Their agenda is to see that the state remains united. Meanwhile, protests by employees, teachers, lawyers, students, women and people from all walks of life continued in Seemandhra for the 23rd day. They took out rallies, staged road blockades and formed human chains to demand the centre to withdraw its decision.